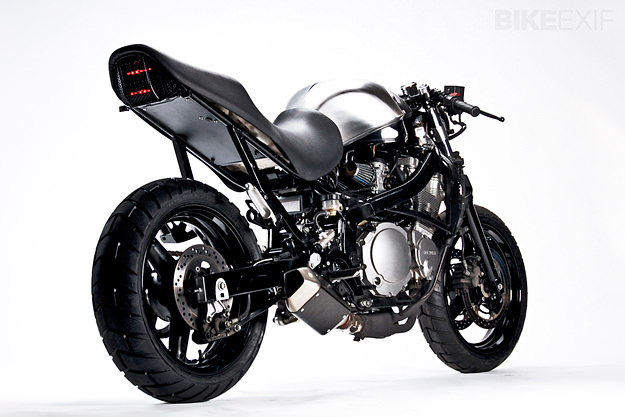 When we heard that Motohangar had ripped the bodywork off a Suzuki Katana, we were dismayed. 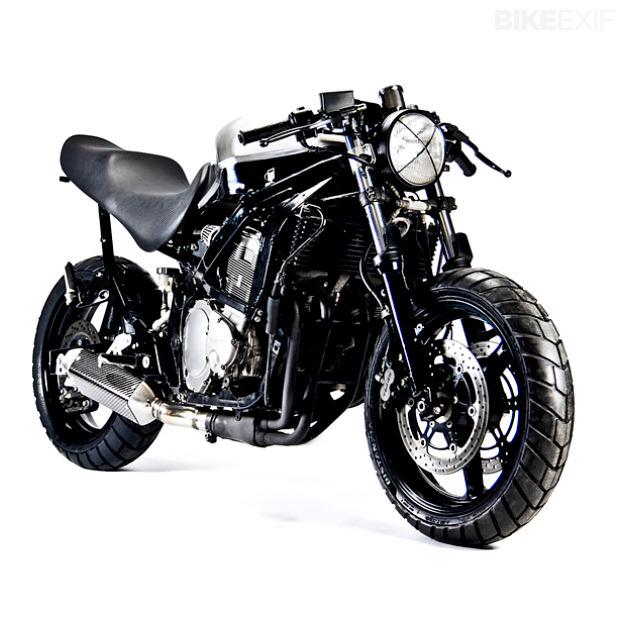 After all, the Katana is one of the most iconic motorcycles ever made. But then we found out that Patrick Jones and crew were revitalizing a 2006 Suzuki Katana, not one of the 1980s originals. A little research revealed that the name was revived in the USA for the GSXF range, a series of bland sport-tourers with none of the angular magic of the original. 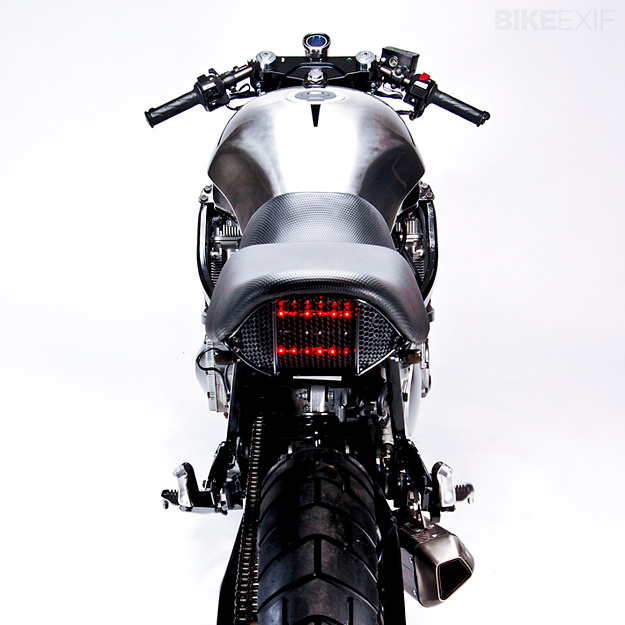 The budget was small, so the huge seat was given a starring role and the taillights were fitted underneath, after a little subframe modification. 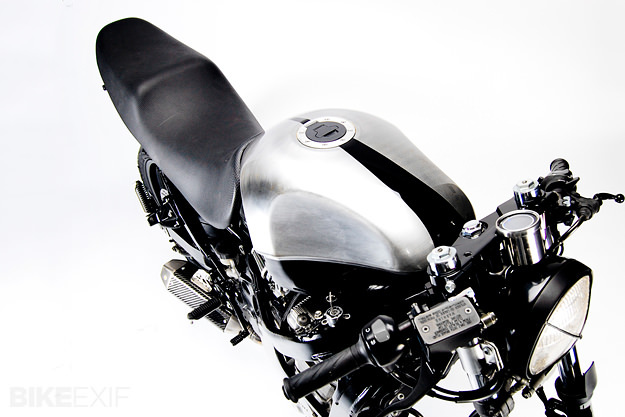 The stock GSXF tank was stripped back to the metal, and minor black detailing was added elsewhere for a monochromatic look. A shortened FMF exhaust system suits the style of the bike and was a major part of an overall weight-reduction regime. The rest of the work was relatively straightforward: relocating the battery, adding pod air filters, and re-jetting the carbs for maximum performance. To improve the stance of the Katana, Patrick lowered the front end a tad, and then added Vortex clip-ons and a GT380 headlight. And it looks good. Maybe not as arresting as the original German design, but a helluva lot better than the starting point. 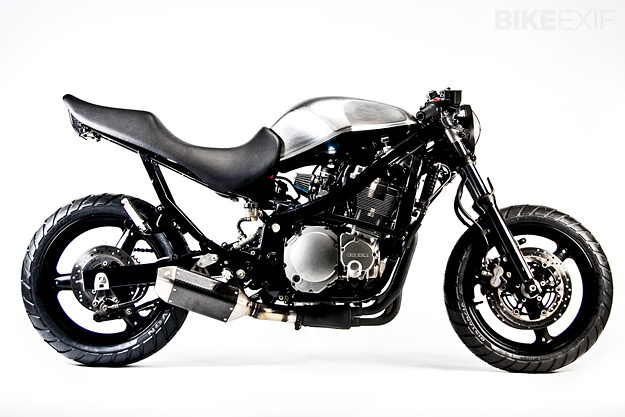 If you’ve ever seen a GSXF ‘Katana,’ you’ll know that Motohangar has done an amazing job. Got a taste for 1980s styling and the best part of $50,000 to spare? Then check out the resto-mod Katanas available from the Japanese shop AC Sanctuary.